Located across the bay from Annapolis (just 1.5 miles from the bridge), this is a convenient, quiet, and beautiful alternative to a hotel. Near to the Chesapeake Bay Beach Club, shopping, parks and Matapeake/Terrapin Beaches. Convenient to Annapolis, Baltimore, DC, Easton and St. Michaels. This 600 square foot 1 BR/1BA in-law apartment has a private entrance and full kitchen. Watch the ships and wildlife from the living room. Enjoy the pier, patio, and garden. Off street parking, wheel chair accessible with handicap features. Fully furnished including linens and kitchen equipment, queen bed, Direct TV, Wi-fi, access to pool and ping pong table, treadmill, grill. No parties or events. Non-smoking. Small pet considered on individual basis. Contact us for SPECIAL WINTER RATES !!!! We are here for our 30th Anniversary and the Sea Glass Festival in St Michael’s. We couldn’t have picked a better place to stay. The price was right and the description is absolutely accurate. We watched a beautiful sunset, enjoyed the osprey and lounges on the patio. Nabil and Dora Jean are also letting us stay as long as we’d like on our last day. What an Anniversary treat! We highly recommend this in-law suite on the water! Private, peaceful and perfect! We’re off to lunch and will be back to pack up - sadly. But we’ll be back! Clean, beautiful ,with friendly accommodating hosts. This property and our stay exceeded all expectations. The hosts were welcoming, warm, gracious world citizens who made our stay comfortable and afforded maximum privacy. Simply fabulous. Mike & Diane, Pacific Grove, Ca. Hi Mike and Diane - hope you had a safe trip home. We could not have asked for better guests! All the best and come bak soon! Located in a quiet community this pet friendly waterfront apartment was very peaceful. Waterfront views and flowers everywhere. The apartment was equally as nice. Very clean and tastefully decorated. The fresh cut flowers in the bedroom, bath and kitchen was a great touch. And let's not forget our host and hostess. Nabil and Hanna were very accommodating. Greeting us when we arrived and giving us a tour of what they had to offer. Thank you Nabil and Dora for sharing your place with us. We hope to return someday. Beautiful, peaceful setting and gracious hosts--don't miss this one! 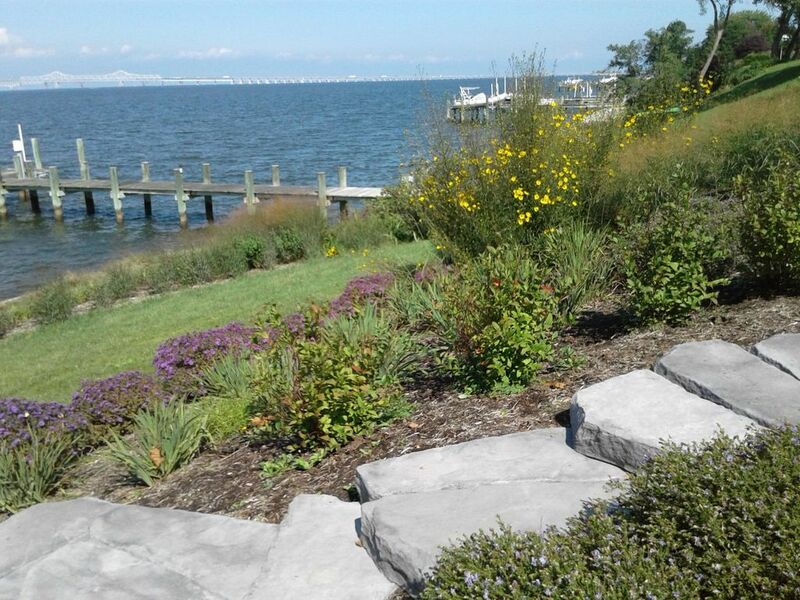 If you want a peaceful stay with a spectacular view of the Chesapeake Bay, this is the place. The expansive view is enhanced by sunsets over the water and (in season) the delightful antics of a family of osprey right on the dock! The apartment was lovely, clean, and generously and artistically furnished. We also enjoyed the charming outdoor patio, gardens, and walk down to the water. Dora and Nabil had anticipated all our needs and were very gracious in welcoming us and answering questions. We will definitely return! Marilyn - It was a pleasure having you both and we are so happy that you had a good time. Looking forward to hosting you again! A very nice relaxing place to stay. Accomodation was in very good condition with a great view and a wonderful hammock to lie in.!! Highly recommended. My husband & I were greeted by the owners & shown the property & then we had our privacy. We were made to feel welcomed. The place was clean & had everything we needed & more. The house & landscaping are super cute. The neighborhood is wonderful. In fact we took a nice long walk around the neighborhood the night we arrived after our long trip. We enjoyed looking at the different homes & beautiful landscaping. We loved watching the osprey Momma, dad, and baby that have a huge nest on their dock. Just fascinating creatures! I watched the sunrise & sunset on the Chesapeake from the our private patio area. The bed is very comfortable. I have to say, after long hot days touring/visiting/walking Annapolis & the Naval Academy, coming "home" to this serene waterfront property was refreshing & comforting. I would highly recommend this property especially instead of a hotel, but also for the comfort, location, & views of the Chesapeake. Absolutely wonderful property & owners!